Mods, feel free to move this if there is a more appropriate existing thread for this. Looking forward to taking a ride on it soon. It normally annoys me slightly, but I love that when I click on that link, I get a pop-up about cookie control. Past times at Ridgmont, aye? Vivarail has announced that the first fleet of Class 230 trains have all been safely delivered to Bletchley depot ahead of entering service. The class 230s will be operated by London Northwestern Railway. Units 230003, 004 and 005 will be in passenger service on the Marston Vale Line. All delivered ... so when is the first service? 230003, along with 004 and 005 were meant to be in passenger service in 2018, but were delayed. The Class 230 trains will run alongside the Class 150s and 153 that currently operate on the line. Probably sensible to keep the other "older" units in place for a while - though solitary 153s can become a little wedged. Guess they have until the end of the year as the 153s don't have compliant disable access loos, and I'm not sure about LNWR's 150s. 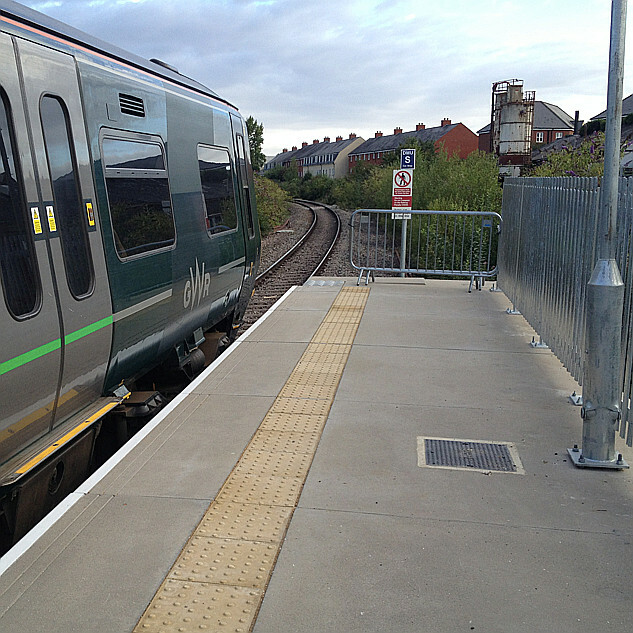 THE first example of Vivarail’s refurbished D-Trains is carrying passengers on West Midlands Trains. The inaugural service left Bedford at 05.16 this morning, bound for Bletchley. Blimey, Railnews seem to have stolen a march on Vivarail's own website where, until just now at least, there was no mention of it. My guess is that a few other TOCs may be watching how they do. Our very first train has successfully started serving the passengers on the Marston Vale line – running the 0516 this morning. The first Class 230 D Train has entered passenger service on the Marston Vale line this morning (Tuesday 23 April). Unit 2300034 is now in service on the route between Bletchley and Bedford. The train, which has been developed by Vivarail, will provide extra capacity and improved customer experience for passengers on the line. The first service to operate was the 0516 from Bletchley this morning. London Northwestern Railway will be operating three new two-car D Trains on the route once the project is completed this Spring. The interior of the trains features fully accessible toilets, various seating options, more space and USB sockets at every seat. The D Trains are also quiet, green and clean, with automatic engine shut down when the trains are at stations. The lightweight aluminium bodyshell also means the train uses less fuel, have superior acceleration and provide swift and comfortable journeys. The trains feature a special London Northwestern Railway livery for the line, with artwork from local artist Alisha Miller. Alisha was commissioned to produce three locally-relevant designs, that will be displayed on inside the trains. Alisha said: “It’s been a wonderful experience working along the picturesque Marston Vale line. I’ve met such friendly staff, passengers and community members who have helped inspire the three new artworks I’ve created for the Class 230 trains”. The remaining two D Trains will be introduced on the line in coming weeks, and will be maintained at the Bletchley depot, creating new jobs in the local area. The Marston Vale Line will also benefit from enhanced timetables from Monday – Saturday from May, when London Northwestern Railway introduces it’s new May timetable. There will be an hourly service throughout the day on the route. A Sunday service will be introduced on the route from 2021. Does anyone else think these would be ideal for some of the west country branches, eg Looe, St Ives, Falmouth in battery form. Vivarail says it can do 60 miles between charges, and then fully recharge in 7 minutes. Even though turnarounds are tight, if they can accelerate faster that would give another couple of minutes for a top-up each end. The Bedford to Bletchley line, the Bidston to Wrexham line, and the Conwy Valley (when it's running) have all used rolling stock atypical to the lines they connect with, but on the Cornish branches similar units are used on the main line too - at least on some services, and I can see GWR being less than thrilled at having yet another type of train to maintain. Even on Bletchley to Bedford, I noted one of the advantages stated being that the new trains will bring maintenance jobs. There *are* other potential outposts with similar characteristics ... I wonder about Barton on Humber though the isolation there is more due to the franchise map which I think may be changing. In terms of battery charge time and train cycle time on a clock face, both St Ives and Falmouth lines have limited stop station for (it is said, how simplistically true I don't know!) robustness in actually fitting in the clock face, and doubt the D trains will be THAT much faster. Looe is also tight. 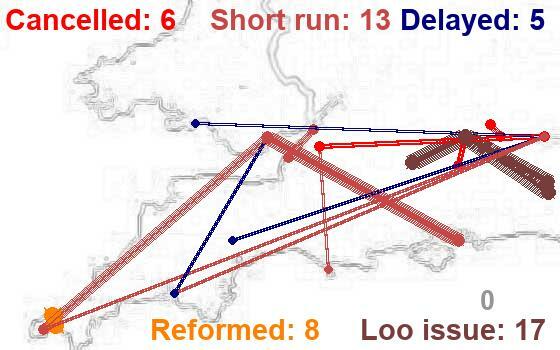 Indeed, on their first morning on Marston Vale the six single journeys each lost between 2 and 7 minutes. But not good long term evidence, I appreciate, as the drivers would have been being a bit careful and the passengers relocating up and down the platform to where the doors were. Not sure where (in terms of minutes run) the loop at Goonbarrow is on the Newquay line - but if someone were really brave and ran an hourly service, it would have charging time at each end. But back to 'special case', an extra train, and I don't know the business case - there are others here far better informed than I am to answer. And perhaps you could operationally do similar with hourly to Gunnislake, putting both trains in the platform at the same time at Bere Alston. And generating screams of protest from the people working for trains to Tavistock, (or Okehaampton ) as to how their service could then be fitted in. One difference is that the Marston Vale trains are not battery, so won't have the extra acceleration that Vivarail claim the battery ones will have. My thinking was that even 3 or 4 minutes charge each end would be enough for a full top up each journey - I agree some of the turnarounds are tight, but on the St Ives line you only need about 2 minutes charge to replenish the energy used on the return journey. I agree that GWR probably wouldn't want an extra type of train, but I was just trying to think out of the box. I think they have more doors too, so could be useful for loading quickly on the St Ives line in the peak season? Out of the box is good ... I have (personally) been around long enough, and carved a niche, which means that people take speculations I write with more seriousness than I would like. But I do ask myself questions just like the ones you do (and some others too). I looked at the comments the other day about more 158 and 159 units for the London to Exeter service, I look at the desire to run through London to Barnstaple services, and I look at how the Exeter - Barnstaple service is now running with class 158. I note that the 143 units are going, the 257 and 255 units are lovely but surely have a limited lifespan, that the 150s are certainly not teenagers and as new franchises come in elsewhere in the UK, they bring new rolling stock.